highlights of reading group. The meetings often ended with a heated Harry Potter debate in which everyone participated passionately! Throughout the year we read many books such as The Woman in Black, Demon Road, The Lauras and many more. My favourite book was Demon Road, as it was very captivating and kept me on the edge of my seat throughout. Overall, Reading Group has been a fantastic experience and it has allowed me to enjoy reading even more than I did before! the country’s fastest growing youth movement with over 400,000 graduates to date and Hymers College is the only independent school in the country to be a NCS provider. 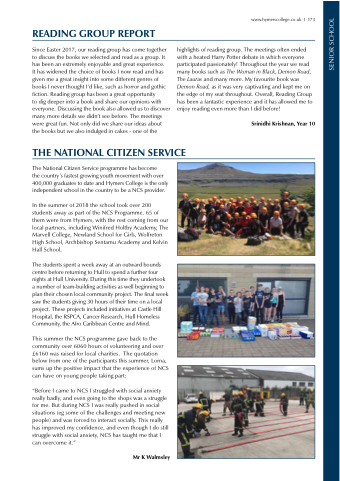 In the summer of 2018 the school took over 200 students away as part of the NCS Programme. 65 of them were from Hymers, with the rest coming from our local partners, including Winifred Holtby Academy, The Marvell College, Newland School for Girls, Wolfreton High School, Archbishop Sentamu Academy and Kelvin Hall School. The students spent a week away at an outward bounds centre before returning to Hull to spend a further four nights at Hull University. During this time they undertook a number of team-building activities as well beginning to plan their chosen local community project. The final week saw the students giving 30 hours of their time on a local project. These projects included initiatives at Castle Hill Hospital, the RSPCA, Cancer Research, Hull Homeless Community, the Afro Caribbean Centre and Mind.